Above: Immigant rights are human rights. By Susan Melkisethian from flickr. The ugliness of US immigration policy is once again evident. There is national outrage that separating children, often infants, from their parents is wrong. There is also national consensus (nine out of ten people in the US) that people brought here by their parents, the Dreamers, should not be forced out of the country as adults. The highly restrictive, dysfunctional immigration system in the United States serves the interests of big business and US Empire. Investors can cross borders to find workers who will accept slave-labor wages and dangerous environments, but workers cannot cross borders to find better wages and safety. 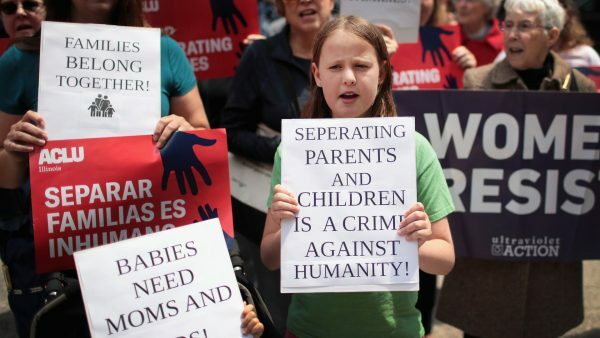 Protest against separating parents from children. Photo by Scott Olson for Getty Images. President Donald Trump claims he hates to have to separate children from their families at the border and that he is merely enforcing a law passed by the Democrats. This is a false description of why children are separated from their parents. 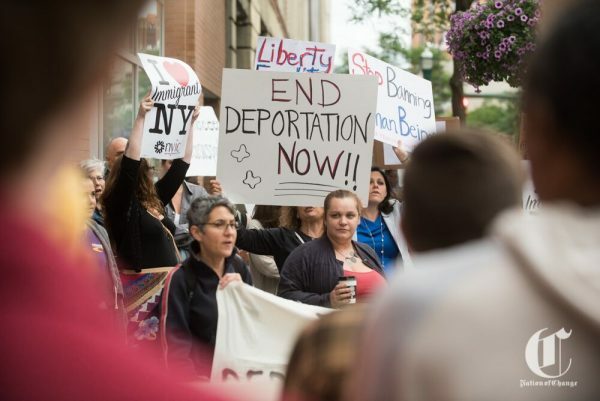 The reason for the separation is that the Trump administration has decided on zero tolerance criminal enforcement of immigration laws. A 1997 court settlement in Flores barred children from being imprisoned with their parents. In 2014, President Obama put hundreds of families in immigration detention but federal courts stopped them from holding families for months without trial, resulting in the release of families to return for trial. Trump has taken the approach of arresting the parents and holding the children. The Department of Health and Human Services, which is responsible for taking care of “unaccompanied alien children,” the label put on these youth, already has 11,000 immigrants under the age of 18 in its custody who haven’t yet been placed with relatives or other sponsors. Under the new Trump policy, 2,000 children have been separated from their parents in just six weeks. These youth are held in tent cities and warehouse jails, which could fairly be called prison camps. This is resulting in heartbreaking stories. A man from Honduras, where the US supported a coup, Marco Antonio Muñoz, killed himself in a detention cell after his 3-year-old son was taken. CNN reports agents ripped a Honduran woman’s infant daughter from her arms while she was breastfeeding. The New York Times reported on one child, referred to only as José, also from Honduras, who refused to take a shower or change his clothes after being separated from his parents as he didn’t want anything else taken away from him. The American Academy of Pediatrics says separation will cause “irreparable harm” to children. While Jeff Sessions and Sarah Huckabee Sanders have used the bible to justify the policy, there is a revolt among Trump’s religious base. The Chicago Tribune reports “The Rev. Samuel Rodriguez, who delivered a prayer at Trump’s inauguration, signed a letter calling the practice ‘horrible.’ Pastor Franklin Graham … a vocal supporter of the president’s who has brushed aside past Trump controversies, called it ‘terrible’ and ‘disgraceful. '” Russell Moore, president of the Ethics and Religious Liberty Commission of the Southern Baptist Convention, described “a groundswell of opposition from virtually every corner of the Christian community.” The U.S. Conference of Catholic Bishops and the Southern Baptist Convention issued statements critical of the practice. Even Evangelical Trump supporters are speaking out against it. Separating children from their parents is justified as a deterrent to convince people not to attempt to cross the border, but it has not worked. The children are also a bargaining chip. Trump will not change the policy unless Congress agrees to his immigration demands, including the border wall, tightening the rules for border enforcement and curbing legal entry. In turn, the Democrats are using child separation as a tool for the 2018 election. Both parties are holding immigrant children hostage for their agendas. A group of students lead the larger crowd that turned out and showed up in support of Deferred Action for Childhood Arrivals (DACA) at Acacia Park and ended their rally at the office of Cory Gardner on Tuesday September 5, 2017 in Colorado Springs, Colorado. (Photo by Dougal Brownlie, The Gazette). Immigrant youth are also being used by Trump to force negotiation for tougher immigration policies and by Democrats for the 2018 election. Trump’s repeal of policies protecting youth brought to the US by their parents has resulted in outrage and national consensus that these youth should not be punished. 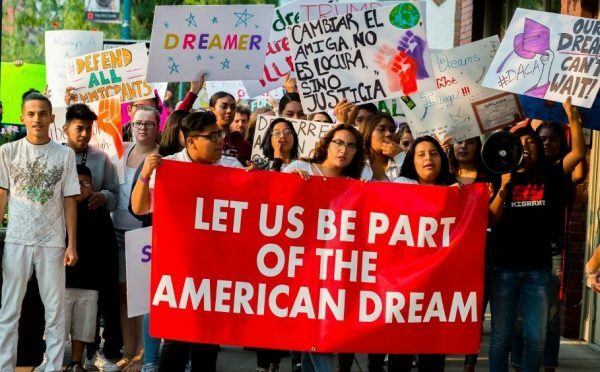 A CBS News poll found 87 percent believe the Dreamers should be allowed to remain in the US. Dysfunction in Congress and an obstinate White House have left these youth in limbo-risk. Obama allowed certain immigrant youth brought to the U.S. without documents as children to live and work here without fear of deportation. Trump reversed that, announcing he would rescind the program, and gave Congress six months to find a legislative fix. His rescission has been blocked by a federal court. President Trump sent mixed signals last week. First he said he would veto a bill that would protect Dreamers from deportation, then the White House reversed that statement saying Trump had misunderstood the question and would sign the legislation passed by Congress. People in both Chambers are trying to find a way forward, but sensible immigration laws have lots of barriers to overcome. Across the country there have been rallies for immigrant rights. Groups like Mijente and the Cosecha Movement are doing strong organizing for permanent protection for all immigrants. Last week, actions were focused on the issue of separating parents from their children. These types of immigration policies have existed for multiple administrations. Trump has not come close to Obama’s record level of deportations. From 2009 to 2016, Obama oversaw the forcible removal of more than 3 million undocumented immigrants. ICE under Obama averaged 309,887 arrests per year from 2009-2012, while ICE under Trump averaged 139,553 in 2017. Obama set records between 2008 and 2014 for the number of people arrested and placed in deportation proceedings. Remember that there were multiple mass protests against Obama on immigration throughout the country. Protesters blocked traffic around the White House highlighting how “Obama deports parents.” Obama did not use the harsh anti-immigrant rhetoric of Trump, but he had strong enforcement policies against immigrants. Immigration, as we noted at the outset, is tied into issues of corporate trade agreements, regime change, US Empire, the drug war and capitalism. These issues are forcing a race to the bottom for worker rights and wages and destruction of the environment. They are driving a growing security state, militarization of law enforcement and mass incarceration. Border patrols lock people into countries where they face poverty, pollution and violence with little chance of escape. Immigrants are the scapegoats, but it is the systems that are driving migration. Most people would prefer to remain in their home countries where they have roots, family and communities. Extreme conditions drive people to abandon everything and endure harsh and dangerous travel in hope of finding safety and the means of survival. This is typical divide and conquer – encouraging us to blame each other and fight while the wealth of the elites expands. We are all hurt by the systems and crises that drive mass migration. This includes climate change as well. While we take immediate action to protect immigrant children and families, let’s also speak out about the connections between migration and the many crises we face. We need to educate those who are being misled into blaming immigrants for the conditions that force them to leave their homes. We must work in solidarity to create democratized economic systems, demand trade agreements that strengthen worker rights and protection of the environment and transition to a clean energy economy and a foreign policy that respects the autonomy of peoples while we also end racist systems, militarism, imperialism and mass incarceration. Credibility problem: not acknowledging damage done WITHIN US, only what’s outside the border. UN report, US has 40 million living in poverty,15 million living in third world level poverty. 60K foot view: reorg’ing poverty on the globe isn’t ‘solving’ anything, nor will open border. No, they didn’t. They ignore damage within the US. Cowardice.
? Sorry, I don’t understand your comment. They didn’t say it all, as Jon put it. The author is says nothing of the damage done by these policies/practices to the citizens in the US. These policies/practices are for the best interests of Wall St, and diminishes the rest of the populations, here and abroad. Do you read this site regularly? Do you know anything about Kevin Zeese and Margaret Flowers? They’re well aware of the damage being done to U.S. citizens by American corporations. And they write about it and protest against it all the time. Not every article can cover every thing. Different articles are about different topics. Response was to _Jon’s_ comment. Kevin, I’m on the side of democracy, inclusiveness, and a people’s peaceful and patriotic Political/economic and socialist “Revolution Against EMPIRE” [Justin du Rivage, on our First one]. I think I’m starting more and more to get the ‘Strategic Narrative” of EMPIRE out as the proximate focused and targeted meta-cause of all the ‘issues’ of; immigration, racism, guns, war, and more with (and through) the more influential and opinion-setting NY “Times”, along with principled left progressive sites like TruthDig, Common Dreams, Popular Resistance, AntiWar, etc. TOM BROKAW: Well I agree, listen. You know, when Donald Trump talks about security or Ben Carson, we’re talking about three-year-old orphans who are orphans and refugees because of American policy. And I’ve pointed out that in addition to Tom blaming it squarely on the “American policy” of causing the Middle East wars that drove refugees into Europe, that it’s also “because of American policy” of acting like a militarist global Empire. And now, three years later, what both our feckless Vichy-like parties have managed to do, by doing nothing, is to drive kids from multiple over-gunned and drug exporting countries south of the U.S. into our own country — just as it caused those “orphans and refugees because of American policy” coming into “Trump’s Cages” (which BTW, serves Emperor Trump’s political agenda of ‘winning’ by metastasizing America into even more of an obvious global Empire than Brokaw could imagine. And, now, the same divided, and deluded lumpenproletariate that Emperor Trump birthed in 2015 has been lied to and enflamed, to support and follow a ‘leader’ (‘Fuhrer’ in German) and faux-Emperor Trump into Making America an Empire Again. As Americans know, we were ruled by an Empire to 1775, but “We can’t be an Empire” again. As Obama liked to say, if not do, “The arc of history bends toward justice” and away from EMPIRE — but very slowly. Kevin, I guess my second post on this article (regarding my assessment of Emperor Trump’s torpedoing “Immigrants’ Rights” was ‘detected as spam’ and deleted because it may have contained too many of my comments in the NY “Times” being linked, eh? Here’s another copy of that second comment I tired to submit to your site — if you want to take a ‘second look’ at whether it’s OK to post on your excellent “Popular Resistance” site. If the “Times” headline of “U.S Retreats on “Zero Tolerance” — was an attempt to rub the bad puppy’s (Emperor Trump’s) nose in his feces, their symbolic confrontation isn’t anywhere near enough ‘obedience training’ to accomplish our goal. “Calling-out” an Emperor, like Emperor Trump, will only work by explicitly, overtly, consistently, and with the aid of a large number of ‘we the people of America’ being willing to teach the ‘bad puppy’ — or more directly send the ‘bad Emperor Trump’ — to a; shelter, internment camp, detention facility, or just ‘out of the previously honorable office of president’ quickly. To which I would add here regarding “Confronting Trump”, that it is essential for any people/citizens, when the leader of any country, under whatever circumstances, and with whatever title (president, chancellor, etc. ), is found to be increasingly ‘acting like an Emperor’, and/or absorbing unwarranted powers across the parliament, congress, courts, etc. to himself, then the only non-violent option that ‘the people’ have in saving and restoring their citizen rights of self-government, is to jointly in their own ‘common interest’ to simply call-out, and ‘expose’ the wannabe Emperor.